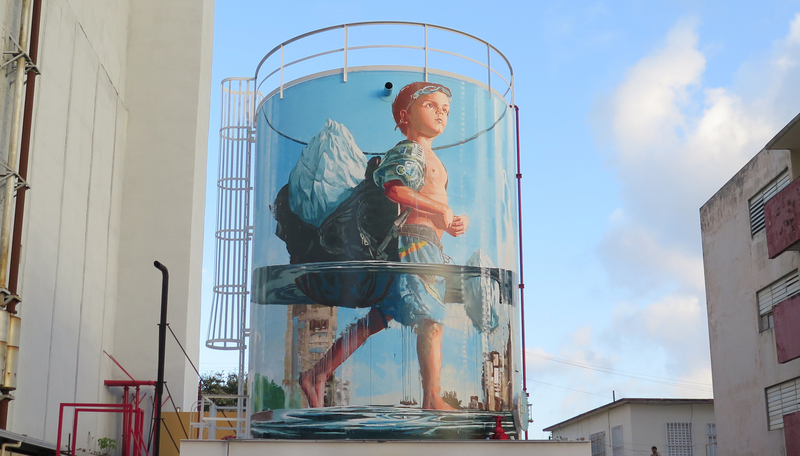 Fintan Magee is a muralist based in Sydney Australia. Born in 1985 in Lismore NSW to an architect mother and father who was a sculptor, he started drawing at a young age and became involved in the Australian graffiti scene at the 13. Moving away from traditional graffiti in 2010 his large-scale paintings often inhabit the isolated, abandoned and broken corners of the city. Drawing from personal experience and the mundane his figurative paintings are deeply integrated with the urban environment and explore themes of waste, consumption, loss, transition, and the environment and his works contain a sentimentality and softness influenced by children’s books and the Low Brow art movement. He has solidified his position as one of Australia’s leading public artists and has traveled extensively, completing projects in London, Vienna, Los Angeles, Miami, Atlanta, Buenos Aires, Copenhagen, Moscow, Rome and Dublin amongst others. – I´m so happy to have Fintan in our line up for No Limit. His large murals are true master pieces and the way he sometimes does incorporate the surroundings in the painting makin it hard to distinguish where the wall start or ends, is nothing but amazing. I think Fintans piece in Borås will be a true favourite for many of our visitors, says Shai Dahan, curator of No Limit Street Art. – I´m really happy for the variety of our artists and the art styles they represent. Fintan, who has done everything from large scale murals to canvases and installations, is a really strong add to our line up and I look forward to see his piece on some huge wall in Borås, says Stina Hallhagen, project manager.